Xishuangbanna meticulous information: your demands regarding your travel, with instructions about tours and convenient solutions for hotels and rooms arrangement. 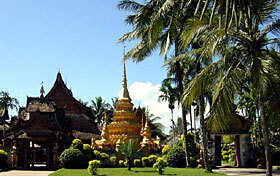 Hotels: Xishuangbanna and Booking China service, discount hotels at small prices. Travel: you can update about Xishuangbanna tours to discover the main highlights and to visit the famous tourist lands in the surroundings. 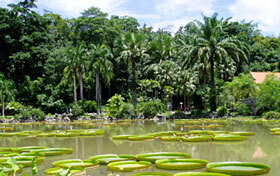 Xishuangbanna is the most complete our tropical ecosystem conservation traveling areas known as a "kingdom of plants", "plant genetic resources of the" and "of the plant kingdom became a emeralds" laudatory name. In this magical land of the depths of a dense 539 terrestrial vertebrate species, 427 species of birds, including Asian elephant, white black peck wood Ukraine, Bear monkey, Green peacock, and other key state protection for 45 species of rare animals. Numerous plant kind belongs to and interlocks and grows each other, have formed the tropical rain forest, tropical zone Ji YuLin, evergreen foliage forest of subtropical zone, liver moss evergreen foliage forest , the south subtropical conifer leaf broad leaf mixed forest , bamboo wooden mixed forest, bush forest,etc. complicated various vegetation view, two pairs receive and also abound with rubbers, it is the second largest glue area in the whole country, the rubbery per unit area yield ranks first in the whole country. Recommended travel spots: Ethnic December days at the tree, shaking Lun Botanical Garden, and Xishuangbanna Jiaoyuan, Xishuangbanna described Linsenlin Park, Xishuangbanna shaking the wild butterfly farms, Yexiang valley, Yi Wu ancient town.